With enough distance we can see that the political philosophy of the alt-right movement is a reaction to the inexorable movement towards progressive leadership including climate action. In the arc of history the alt-right's climate denial is a brief detour. On the one hand this is comforting but on the other hand we have to acknowledge that this reprieve from responsible governance may slow us down just enough to make it impossible for us to keep global temperatures from warming beyond prescribed scientific limits. "[T]he world is not flat, and no amount of bluster makes it so. And for a long time now, it’s the multinational corporations that have had the economic power to effect needed change. So, to remind us that there’s serious weight behind many sustainability agendas." A Greenbiz article by Alan AtKisson President & CEO AtKisson Group makes a similar argument. Trump and the alt-right movement is a blip on the road towards more responsible environmental governance. This is the point he made in an article titled, "Why progressive sustainability ultimately will win". AtKisson quotes Russian right-wing philosopher Alexander Dugin as saying the tide will eventually turn. He sees the current political shift in the US and elsewhere as being part of a predictable political "oscillation" between progressive center-left and the alt-right. This oscillation as Dugin describes vacillates between those who acknowledge globalization and sustainability (progressive center-left) and those who resist it (alt-right). The latter would like to see a return to security however, their political philosophy is steeped in the denial of our changing reality. The conservatives in the alt-right are pinning for something that is gone forever. As with all forms of conservatism, they are incapable of embracing change when this is precisely what is required. "[H]istorically, progressive sustainability appears to be winning overall: because it is the source of new ideas and possibilities that solve the world's real problems. Those problems will not go away. The backward-looking vision offered by the nationalist-right simply cannot solve them." With the rise of things like the SDGs right wing nationalists see that the arc of history is moving them ever further away from their core ideology. So while the trend is clear and the Trump administration can be interpreted as a predictable anomaly, they are still capable of slowing down climate action so that we will miss the window of opportunity to act. 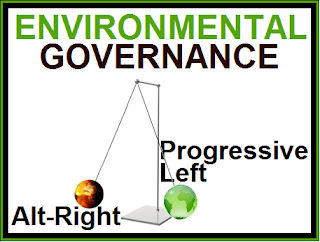 Progressive governments have advanced a more diverse and environmentally conscious agenda. However, right-wing nationalists see this as "evidence of their ultimate defeat on the global stage." So we can anticipate that Trump and his ilk will be replaced by more responsible governments. However, as pointed out by Atkinson, "Things are likely to get much worse before they start getting better again." We can minimize the damage done by Trump and other conservative governments. We can take heart that "Eventually, the pendulum will pause and swing forward again". The drivers of sustainability should not be underestimated but that does not make them impervious to Trump. While the business community has shown great resolve and made considerable progress on climate action, we cannot ignore the fact that market forces and business leadership may not be sufficient to keep us from passing tipping points from which we will not be able to recover. "[T]hat does not mean I am optimistic about the immediate prognosis. We have been surprised at the strength of this backlash at every turn. The men and women leading it are hard-headed and deeply committed to their world views. Their constituencies are still growing," AtKisson said of the alt-right movement, however, he goes on to say. "We must match their hard-headedness with a steely determination of our own."